The Card you won't want to throw away and makes a great Gift! 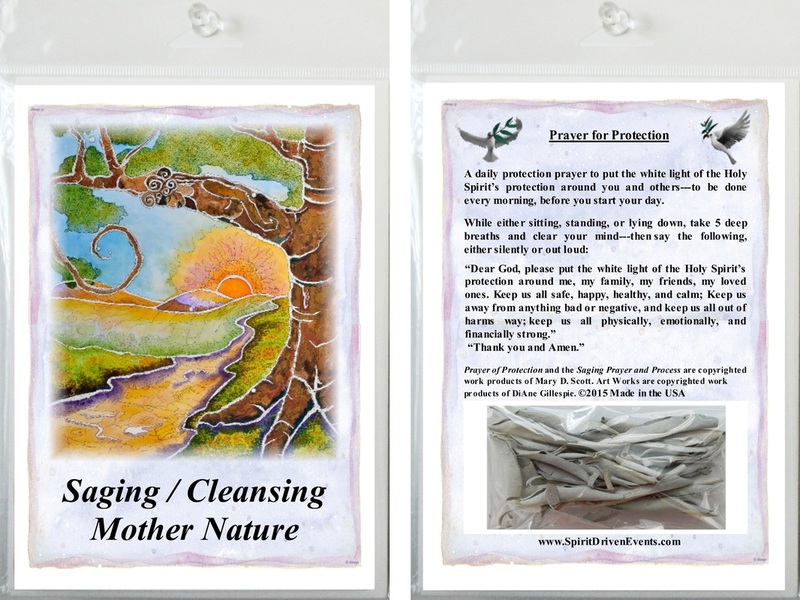 Give the Gift of a Spiritual Cleansing! The 5” x 7” cards are printed on 120 lb. smooth white card stock and the envelopes are in 80 lb. cool white paper. 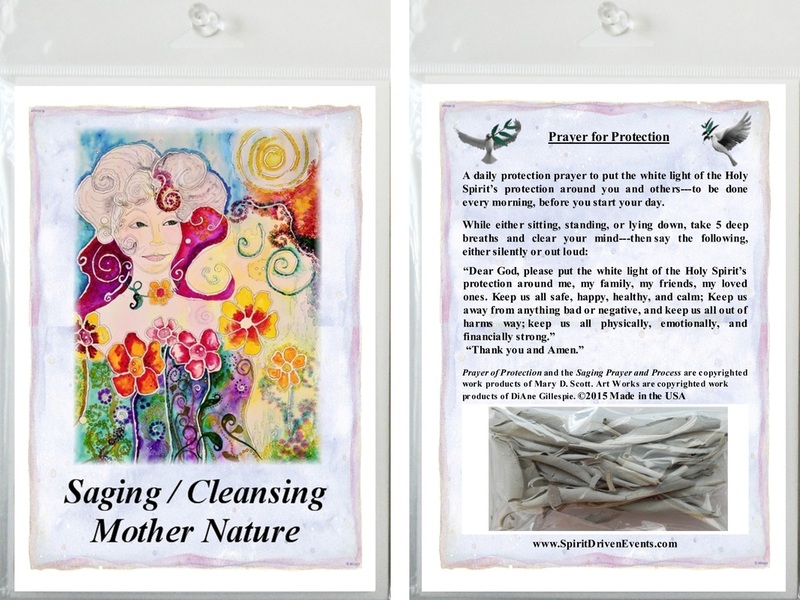 Card Features a Saging Prayer and Process, Protection Prayer by Mary Scott, and a packet of White Sage Leaves; and Art Work by Mary Scott, Judy Gavin-Holton, and/or DiAne Gillespie. Note: The Saging Prayer and Process is customized for Indoor and Outdoor Uses. 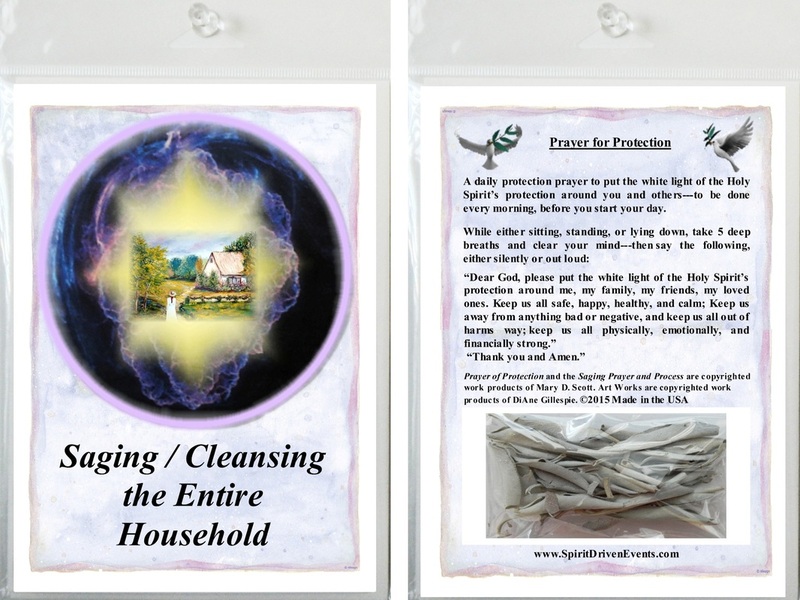 Shown below is the packaged view of the Front and Back sides of the card. 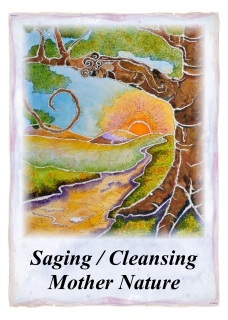 Additional Art Work and "Saging Prayer and Process" are inside the card. Art Work by DiAne Gillespie. 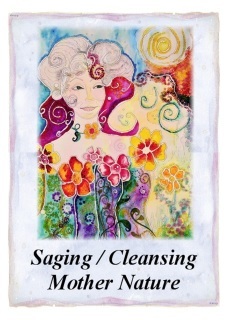 Saging is also known as “Cleansing” and/or “Smudging.” I prefer to use the terms Saging and/or Cleansing. 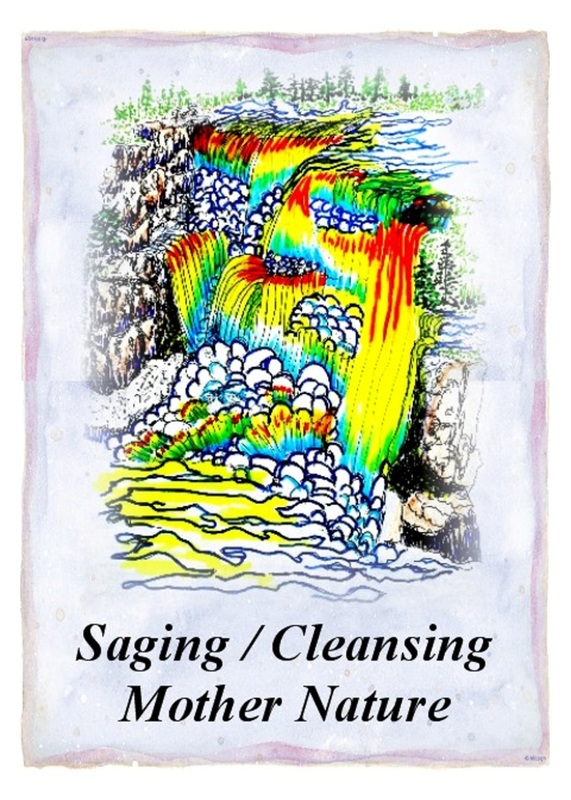 Saging is performed to get rid of negative energies, negative entities and/or dark entities. Over the years I have had to cleanse many people and their houses. I have always had great success using my Saging Prayer and Process and so have the others I have shared my Saging Prayer and Process with. Negative and Dark Entities are all around us (both Indoors and Outdoors). Some people can sense, feel, and see them. When these entities get attached to people, they can wreak havoc in their lives. They can make you fatigued, depressed, sick, and suicidal, have cancer and more. Most people do not know when an entity like this is attached to them or in their household; they just know that something is very wrong. One of my spiritual abilities as a Spiritual Healer is to be able to identify and remove negative and dark entities that are attached to people, their household, and/or buildings. I was taught by God, my spirit healers and my spirit allies to recognize and get rid of negative and/or dark entities. I have been successfully removing negative energies, negative entities and/or dark entities for over ten years now. 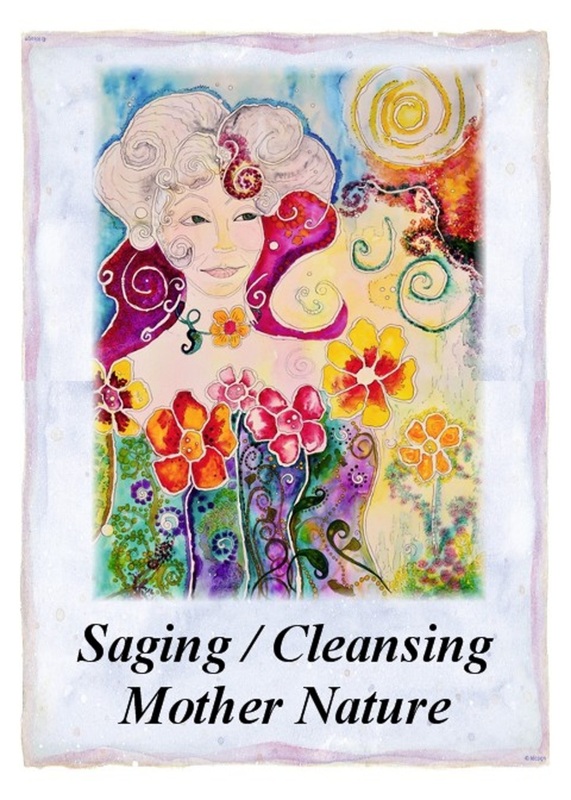 In SDE #289 - Cleansing of House for Sale – Spring 2012: One day I received a phone call from a woman by the name of Deborah. Apparently a mutual friend had given her my cell phone number. This woman wanted to know if I would be willing to come to her deceased mother’s house and cleanse the house. She told me the house had been on the market for almost two years and although it had been shown numerous times, there were no offers. Since the house was nearby I told her I would meet her there in twenty minutes. When I walked into the empty house, it did not feel empty at all. In fact it felt very full and dense. She was right to ask for it to be cleansed. I first went through the entire house and garage and took pictures. Then I proceeded to perform my saging prayer and process. There were two areas of the house which gave me trouble: the garage and the upstairs hall attic area. 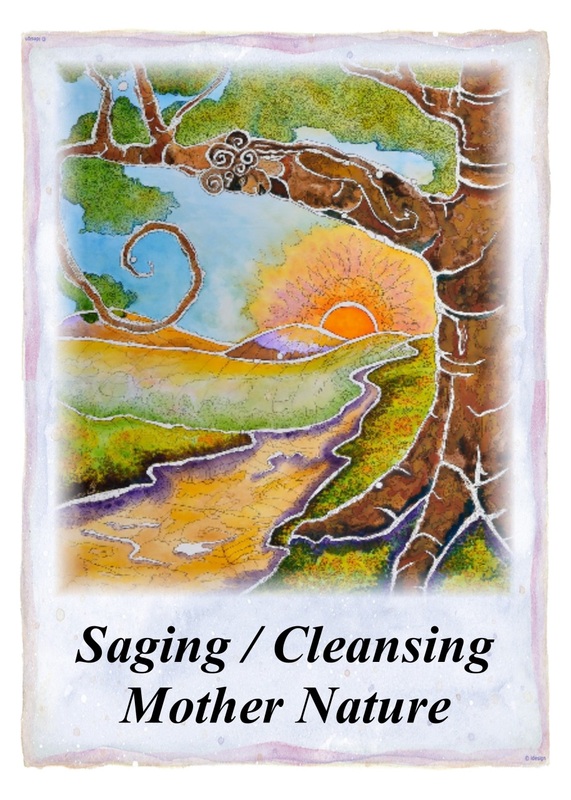 The negative entities do not like the sage and kept trying to put it out. I had to keep re-lighting it and double dousing those two areas. When I was finished, Deborah told me her mother died with a very unpleasant---more like terrified look on her face and she was wondering if I could and / or would say a prayer for her, which I did. When I was all done I told Deborah to air out the house in about 30 minutes or so. Then I went home. About a month later I ran into Deborah at our clubhouse. She told me when she went to air out the house that day, the entire atmosphere of the house felt much better---lighter. She also told me that a week after I cleansed her Mother’s house it sold and she was ecstatic! March 9, 2015: I was talking to a realtor friend of mine, Carolyn, and I asked her if she had ever gone into one of the houses she was trying to sell and felt as though the house was very full and dense. She told me that had happened to her many times. I told her when that happens the house needs to be cleansed because if she can feel it, then most likely so can potential buyers. I told her about Deborah’s Mother’s house and how after I cleansed the house, it sold within a week. Scott, M. D. (2015). 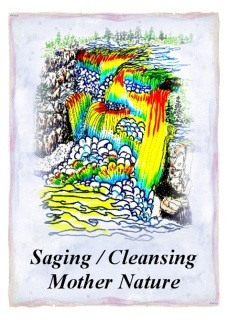 Chapter 2 - SDE #289 - Cleansing of House for Sale – Spring 2012. “Spirit Driven Events II- Fascinating and Enlightening True Stories” (pp. 28-29). Charleston, SC: Createspace. Don't let negative energies, negative entities and/or dark entities get you down and/or wreak havoc in your life, get rid of them instead! And, use my Protection Prayer on a daily basis to help keep you and your loved ones safe.